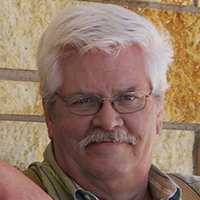 David Bergsland was graduated by the University of Minnesota in 1971. His degree in etching and engraving was in immediate trouble, as far as providing a living was concerned. During school he had increasingly been involved in printing (designing and printing the posters for his psychedelic acid rock band). Turning in that direction immediately brought relief, both financially and emotionally. David found that he loved printing and graphic design. Increasingly he became involved with typography. While not too interested in awards, the one time he was entered in a design competition by a client (with the New York Art Directors' competition) he won a typography award. Increasingly he became focused on typography throughout the 1980s. Beginning in 1991, he began teaching commercial printing and desktop publishing. By 1993, he had gone all digital and was asked by Delmar Publishing to write a book on an all digital workflow in printing. That book, called Printing in a Digital World was released the summer of 1996. Because of his background, the publisher asked him to do all the formatting and graphic design for the book. The result of that was his first fonts, using Fontographer. NuevoLitho and Diaconia proved to be superior fonts for book and newsletter layout. Since that time, David has designed well over a hundred fonts. It has become one of his main sources of relaxation (and income).